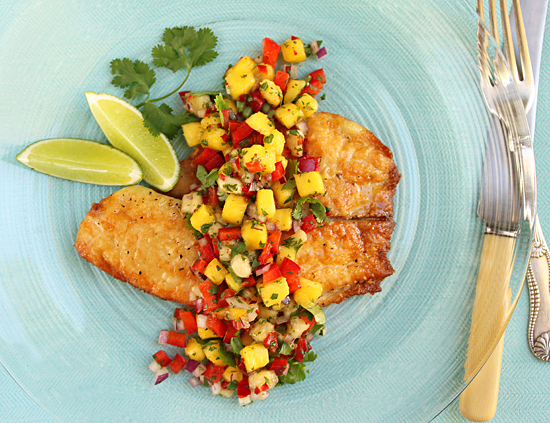 Mango Madness #3 is Mango & Banana Salsa with Talapia, one of my favorite dishes using mangos. I could hardly wait to make this recipe, shoot it and EAT it. Sooo good. 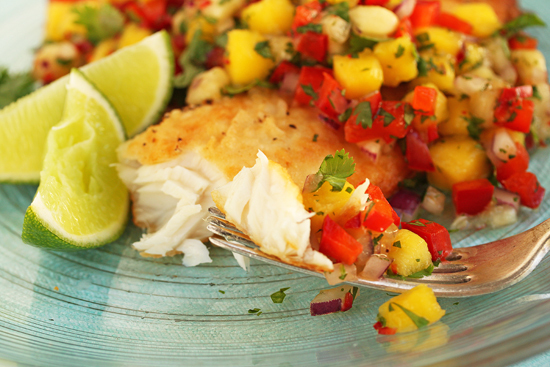 The bananas give this salsa a distinctive tropical Caribbean twist that enhances the flavor of the fish. I love the lime juice and cilantro that make this sparkle. A big Thank You to the National Mango Board for contributing so many mangos for me to get creative with. I have enjoyed every single one. Did you know that one mango supplies 100% of your daily Vitamin C, 35% of your Vitamin A and 12% of your daily fiber? Plus over 20 different vitamins and minerals. And the good news, one mango has only about 110 calories! When you’re selecting mangos, color is not the best indicator of ripeness. A ripe mango will be slightly soft to the touch, even though it is completely green or yellow. Ripe mangos will often have a fruity aroma at their stem ends. Keep unripe mangos at room temperature. When they are soft and ripe, they can be stored in the refrigerator for up to five days. Mango import volume for 2010 was 770 million pounds, which were grown in Mexico, Ecuador, Peru, Guatemala, Haiti, Puerto Rico and Brazil. The Keitt is the only mango grown in the United States. There are six mango varieties that you will likely find at your local grocery store. The Ataulfo variety is smaller and has yellow skin. There are five varieties that are large and green with partially red skin: The Francis, Haden, Keitt, Kent and Tommy Atkins. The mangos I received were not labeled with the variety, but they could have been Francis, Haden or Tommy Atkins, as those are the varieties that are available in May. The Kent is mainly available in July and the Keitt in August. What ever variety they were, they were delicious. Marvelous. Fantastic. Did I mention I love mangos? Please check out my other Mango Madness posts for more great ways to use your mangos. 1. Mix all ingredients together in a large bowl. Serve immediately, or refrigerate, covered, up to 3 hours. 1. Rinse and dry fish fillets. Trim edges if necessary. Dust with salt and pepper. Sprinkle presentation side of each fillet with flour and shake off excess. 2. Heat oil in large heavy bottomed skillet (preferably not non-stick) over medium high until shimmering. Add the fish fillets and cook until medium golden brown and fish easily releases from bottom of pan. 3. Turn fillets over, being careful to keep them intact. Cook until opaque throughout. 4. 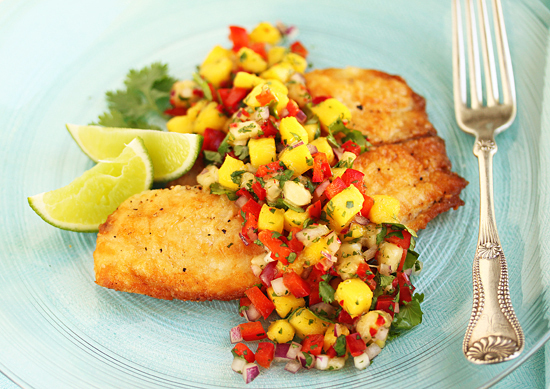 Place each fillet on individual serving plates and top with about 1 cup of Mango-Banana Salsa. Garnish with lime wedges if desired. WOW there needs to be a mango award for you! Brilliantly done. Lynne! This is a stunning meal. I adore mangoes. Just drooling! Now I know what I want to cook for guests next week. Thank you for sharing. I’m sorry I’ve been absent for so long, but I’m glad I’m back. 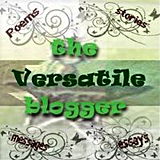 I just moved my blog to a new site, and I’d love for you to visit when you get the chance. I hope you are having a beautiful Sunday morning. I did something similar a while back with just bananas and black beans. http://www.floridacoastalcooking.com/2010/06/clean-eatings-chili-rubbed-tilapia-with.html I can’t wait to try it with Mango! Lynne — I just love this salsa! 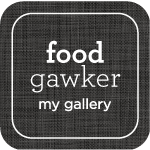 Just linked it in my post for Top Ten Summer Salsas!